In August 2012, Pillars of Peace Hawaii partnered with The Cathedral of Saint Andrew to bring global peace leader Archbishop Desmond Tutu to Hawaii. During his visit, Archbishop Tutu shared his wisdom, encouraging youth to imagine a world full of possibilities and inspiring community members to make their dreams of a peaceful world a reality. Desmond Tutu is a South African social rights activist and retired Anglican bishop who is known for his stand against apartheid. Awarded the Nobel Peace Prize in 1984, he continues to be active in the defense of human rights and campaigns for the oppressed. Following is a highlight video of Archbishop Tutu's visit to Hawaii in August 2012. Below is the PBS Hawaii Long Story Short with Leslia Wilcox featuring Archbishop Desmond Tutu. It originally aired in October 2012. For more information on this episode visit the PBS Hawaii site or their Facebook page with photos from Desmond Tutu's set visit. 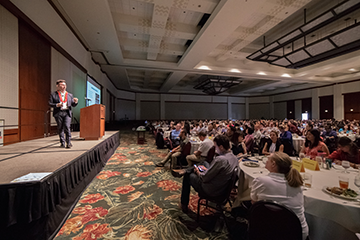 The Schools of the Future Conference featured an Effective Social and Emotional Learning track in 2017 as a result of the partnership with Pillars of Peace Hawaii. Check out the 2017 conference videos. 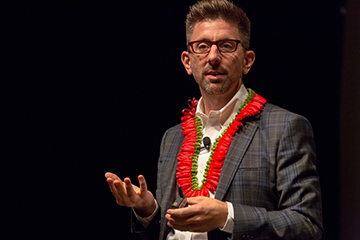 The 2016 Schools of the Future Conference featured for a social and emotional learning track and keynote speaker Dr. Marc Brackett. The Elders closed out their weekend in Hawaii with a public talk entitled "A Just and Inclusive Global Community." Their discussion covered a wide range of topics from helping create peace within families to international human rights.